The Lost Worlds of Gerry Anderson Coming In November! Gerry Anderson created – or co-created with his then wife Sylvia Anderson – a series of beloved TV shows like Mike Mercury: Supercar, Fireball XL-5, Thunderbirds and Captain Scarlet. Not to mention live-action shows like Space: 1999, UFO and Space Precinct. Now several rare Gerry Anderson productions – like his first never-before-seen puppet film Here Comes Kandy, The Investigator, and Space Police (which became the template for Space Precinct) have been collected for the MPI DVD release The Lost Worlds of Gerry Anderson. The Lost Worlds of Gerry Anderson will be in stores on November 14th. Shout! Factory Launches Streaming Service! Shout! 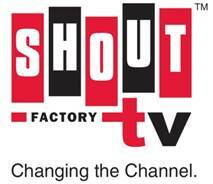 Factory has announced the launch of a branded digital streaming service – Shout! Factory TV – effective today. The service will be available through multiple platforms and will feature Shout! Factory’s cult movie and TV libraries – everything from the B-movies of Roger Corman to The Marx Brothers, The Ernie Kovacs Show to Mystery Science Theater 3000. Follow the jump to learn more.